Specifically designed to hold our Pump-Pak when you travel. Make sure your supplies end up in the same place you do, by carrying them with you. 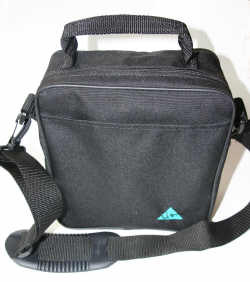 size: 8"w x 12"L x 2"D cordura nylon, non-slip 2" shoulder strap and top handle. Front pocket for tickets, etc. Don’t be without your pump supplies when you travel. Shown above with Pumppak inside. The Carry on Bag will stand on its own when Pumppak is inside.